I remember back in the 70s, being shocked when the amazing Zuma came out so soon after Tonight's The Night. Even though TTN was comprised of songs that had been shelved for two years or more, it was still amazing to get the gem of Zuma so soon after the genius of TTN. I can say Neil has done it again. In early April 2006 when news started leaking on internet blogs that Neil Young had already completed a new album of protest songs, I was admittedly, a bit skeptical. After all, his previous work Prairie Wind was a solid effort and had only been released some seven months previously and its accompanying film Heart Of Gold had not even been released on DVD. But as the evidence mounted, the amazing blog entries were revealed to be factual and that indeed Neil Young wanted to release this as quickly as possible. Via his web site, initially there came a first-person announcement by Neil Young himself, followed by the lyrics to the songs and a timeline, and then a stream of the album itself, which is how I first heard this record. Neil uses the urgency with which this album was created to good effect; one can really feel the intensity of feeling and the powerful messages he conveys. It has been an incredible experience immersing myself in this music. The political nature of the lyrics have produced a firestorm of opinionated forums on the internet but in actuality the music is a very personal thing between the listener and the music as it swirls in one's head. I find the emotions of sadness, anger, hopefulness; I find all of them to be very strong. Shortly after immersing myself in the album, my special lady friend and I happened to be in Washington DC visiting Smithsonian museums and war memorials. At the World War II memorial, as we contemplated the soldiers' sacrifice, she told me that the refrain from the song Living With War was in her head and that the impact of the tune was striking and emotional. 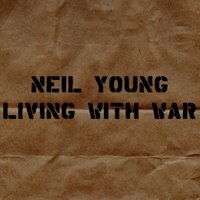 Musically and lyrically, Neil Young revisits some of his earlier work; for example, the song Living With War marks the second occasion in which he has quoted the same passage from the Star Spangled Banner (the first being Western Hero from 1994's Sleep With Angels album.) But the conception and execution of the creation of the album Living With War is a milestone in the Neil Young catalog. It is intense and listenable and powerful and it's incredible to me that a 60 year old man has made this inspired work. I very much enjoyed listening to Living With War today. More reviews and links on "Living With War" April 2006 News and "Living With War" May 2006 News.